The expansion of a rock mine in southwestern Palm Beach County could kill up to a dozen federally protected eastern indigo snakes, the longest native snake in North America, according to a wildlife agency report. The Star Ranch is seeking permission from the Army Corps of Engineers to expand its limestone mine by 1.4 square miles to produce construction materials for roads, Everglades restoration and other projects. The U.S. Fish and Wildlife Service says the work could “crush indigo snakes, their nests and eggs,” killing up to 12 of the 23 that may live there. None of the snakes, which can reach a length of up to eight and a half feet, have been seen on the property, the wildlife service said. But the service said the site is the type of land they use, they have been seen around it and they’re difficult to find because they live primarily underground. Noel Shapiro, a sugar cane farmer who owns the property, could not be reached for comment, despite a phone call to his office. Broward contractor Ron Bergeron, whose company has long had an agreement to mine the land, said he hadn’t seen the report. He noted the service admits not finding any snakes on the site. “They’re just making an assumption that there’s 23, but nobody’s seen one,” said Bergeron, who is one of seven volunteer commissioners who run the Florida Fish and Wildlife Conservation Commission. Bergeron said 90 percent of the mine’s materials will go toward public road-building and Everglades restoration projects – the reservoirs, levees and other structures that will conserve and clean water for the Everglades. Without a nearby mine, he said, the rock would have to be brought at much higher cost from western Miami-Dade County. 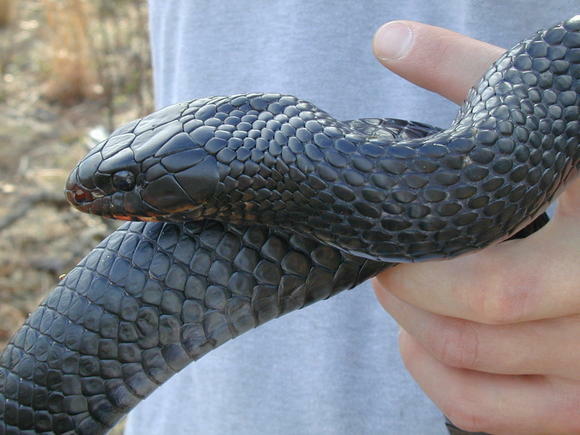 Indigo snakes, which have the rich black color of a grand piano, live in parts of Georgia and Florida, mostly from Central Florida down through the Keys. Non-venomous – and popular for that reason for wildlife shows – the snakes eat fish, snakes, frogs, young gopher tortoises, small mammals and small alligators. Protected as threatened under the Endangered Species Act, the snakes have declined mainly from loss of habitat to development, according to the Fish and Wildlife Service. Other causes include capture for the pet trade and rattlesnake roundups, in which participants spray gasoline into gopher tortoise burrows, where indigo snakes and other animals live, to flush out rattlesnakes. Environmentalists have long opposed the expansion of mining in western Palm Beach County, saying it ruins the landscape and leaves behind deep holes that drain water that should flow through the Everglades. Drew Martin, conservation chair of the Sierra Club Loxahatchee Group, said other projects, such as the proposed development of the Briger tract in northern Palm Beach County, would kill indigo snakes. The opinion letter from the U.S. Fish and Wildlife Service does not say the work should not go forward. Although it said the work would “adversely affect” the species, the letter said the mine would not “jeopardize” its existence, the trigger that could hold up a project. The letter said the mining work would have to comply with standard procedures published by the wildlife service for avoiding harm to indigo snakes.